Greedy goblin: Main spec, or not? Larísa's shall a mage get innervate? question emerged very virulently yesterday. My little mage organized a PuG to 10 man Sarth+0 (my main don't really goes there anymore). Little annoyment on DC-s and such PuG wonders, but all went down safely. I wasn't really proud of my DPS, but I was No3 so it will do. I'm still arcane, I know fire would be more, but arcane has higher spell power and you get into PuG-s by spell power and not damage done. I used 2 mana gems, and 1 evocation. Majestic dragon figurine dropped. It gives 180 spirit as you can see on my main's picture. It's one of the 3 best restodruid trinket (its exact position is debatable). Obviously the restodruid rolled for it, 47. So on my future 20/51/0 talent this item would provide 200MP5, so I rolled, 95. Most of the people immediately told that I was not eligible for the item. As master looter, I could ignore them. I linked the talents and spells to them, with absolutely no effect, they did not attempted to argue, just repeated "healer item", "healer item". Since I couldn't use it instantly (would lose hitcap if I replace my current trinket) and was unsure if I need the extra mana (I used only one evocation without Pyromaniac and arcane is more costy than fire), so I passed. Hunter wants high agi-crit melee weapon and rouge wants it too. Tank wants high DPS weapon (would remain defcapped with it) for more threat, melee DPS also wants it. We are talking about PuGs. In a guild it's maybe better for the hunter to pass on the dagger that gives him +10DPS if the rouge makes +50 since the bosses dies faster for him too. But in a PuG I most probably never see that guy again. So what do you think? Shall one pass for the "more eligible" player or /roll shall decide? Note: If I was sure that I needed the trinket, I would took it no matter what the others say. My philosophy is that "main spec" means that you would use that item immediately (after enchanting, etc.) and use it for the vast majority of the time that you play. Anything less than that is a sidegrade, which is equivalent to off-spec, in my opinion. So in your situation, I'd class it as a sidegrade because you aren't going to use it immediately, rather only use in specific situations, such as fights which strain your mana. While the druid is going to equip the trinket as soon as he gets it, and vendor/DE his old trinket. I wouldn't stress over it too much in PUGs. I think that if you know you'd definitely use it then roll and don't back down. But in a case like this where it's a sidegrade that you might or might not use, it's polite to pass to someone for whom it is a definite upgrade. OTOH, I tanked an archavon PUG the other day on my warrior and the plate PvP warrior gloves dropped. So I rolled and won. And the other dps warriors went ballistic because I had been tanking. So I told them all it was PvP gear and not to be gits and took the gloves. But truth is, I never PvP. I took them because they were an upgrade to my dps gear ;)I don't feel remotely guilty! The real question isn't neccesarily one of whether the trinket provides a benefit to you, so much as whether that benefit legitimately helps you to perform your role. I.E. as a Rogue, yes a trinket with lots of Stamina and a +parry on use would 'benefit' me - Stamina helps me stay alive, and I'm capable of Parrying attacks, clicking the trinket will help me parry more and I can stay alive longer! the problem is, the trinket doesn't really help me fo my job, which is DPS. While mages have talents that benefit from spirit and increase the regen availiable to them from spirit, the inherent problem is that unless said mage is spamming AE for an /extended/ period of time, the mage shouldn't, if played well, need to explicitly GEAR to take advantage of said regen. It wouldn't help you because you shouldn't need those stats to perform your role, wheras a healer should in order to perform his. For an arcane mage, you don't want to aim for spirit anyways. Like all specs, it's always hit>spellpower>crit>haste>intellect/spirit/stamina if you want to increase your DPS. Besides, you be taking the Illustration of the Dragon Soul over the Figurine anyways. I hope that makes a bit more sense. Feel free to edit the last comment and delete this one entirely. @Rohan, spinks, anon: I have that trinket on my resto druid, never use it. If we're only going to allow people to roll main spec need on best in slot trinkets, than no one will be allowed to roll on a trinket like this one, which in my opinion isn't a #1-2 trinket for any class. That leaves your sidegrade theory operable only in the case where someone else is decked out in blues, however, going out of my way to gear up people that come to raids in blues by passing PVE upgrades to them is definitely not on my list of things to do. They can run heroics like I did, or take their chances rolling against me, preferably the former and then the latter. @krizzly: your ranking of stats for arcane mages is not the one I've read on Elitist Jerks, in the Rawr thread. This is why I'm doubtful with letting people dictate loot to other people, I don't like other people telling me which items I should use when I've done the math, or looked up the math, and their opinion is based on what some guy told them what he heard was true from some other guy who possibly might have read the same forum without understanding it. Also, there are 2 trinket slots, you know, what relevance is saying Illustration > Figurine? 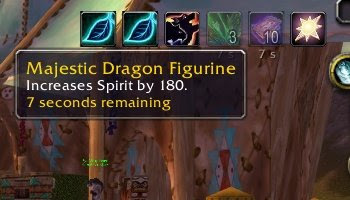 Also, since Illustration > Figurine for any healing class, as well as any dps caster, it's not even a relevant point in the alternate world where toons only have 1 trinket slot. #1 I never go OOM on the hardest fights in the game currently, sarth + drakes, Maly, KT. I'd rather stack spellpower and haste and let the natural mana regen on my gear take care of things for me. #2 When I'm using that trinket, and for whatever reason I get outside of the 5sr, a phase change in a boss, getting immobilized by a boss ability, whatever...I'm like sweet now the spirit really kicks in...oh wait now the stack falls off after 10 seconds, right when it was really coming in handy. I find this incredibly annoying, enough so that if I did a % time in 5sr and % time with buff analysis to compare Figurine to my other trinket choices for the fights that I find difficult, it would have to be substantially better for me to use it. If you actually need the item, and will use it regularly, I say let the all-mighty /roll deicide your fate. Of course this is strictly in a PuG situation. I agree that there sometimes in PUGs may be a problem that there are "general" opinions about the needs of other classes, which not necessarily are entirely true for certain specs. It may be hard to stand up for your own opinion in those situations (even though I have no doubt that you're capable of it!). However I must agree with Rohan about the philosophy that you should be able to use the item more or less immediately if you get it, to consider it a main spec thing. If you want an item to have to swap in in a distant future after possible other switches in your gear, it should be considered sidegrade and should be the second choice to get the item. (First choice of course is real upgrades for mainspecs). About this perticular item, to be honest, the idea wouldn't have crossed my mind to go for it as arcane mage. But maybe I'm not deep enough into theorycrafting to fully appreciate it. Ok, mages can use spirit. But a PURE spirit item? Learn to elitest jerks. Theres way better trinkets for mages. Trinkets with spell damage or crit should be your priority over spirit. Trees and Holy priests put spirit above crit or spell damage. The half decent ones wouldn't roll against a mage on a crit trinket. I have to agree with your pug. Healer item. And yes, I think you would have been very unreasonable to have taken it. 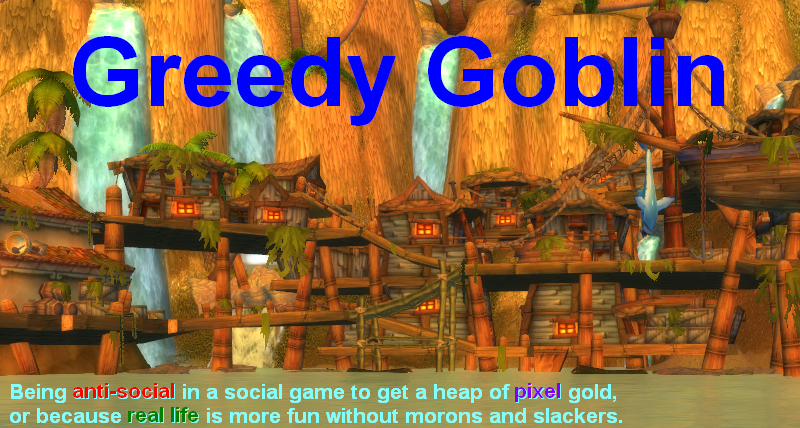 In a pure "goblin wisdom" way, I act differently in pugs than in guild runs. In a guild run, I am there to further promote the ability to do more guild runs. I'm in a solid end-game guild, and I want to continue doing "difficult" runs, so I am willing to accept some short-term losses (i.e. Not getting a piece of gear that is a marginal upgrade, etc) in order to promote a long-term investment (gearing up the rest of the team in order to make later content/later runs easier.) Note that this is balanced by how likely it is for that upgrade, in someone else's hand, to be useful to me... I'm less likely to pass if someone's alt is picking up gear, or a new player to the guild is rolling, or similar things. If this case were a guild run, I'd never roll on it. You've discarded server reputation in the past, and while I mostly agreed with the post, in my case I'm more concerned with maintaining excellent reputation than dodging bad reputation. It's much easier to lose good reputation than gain bad, but it is a minor factor. Ability to continue the current run is more of a difficulty... if you're master looter, and you "go against the will of the group", as it were, they may no longer feel like they should trust you, and may leave the run. If you get a genuine upgrade, and people leave because you won the roll, they're being stupid, IMO, but it is something to consider. It's a balance... do you feel that the gain in getting this item is worth the potential loss of the current run, or potential (possibly negligible) loss of ability to create/participate in further runs? When I PuG, I consider myself an ambassador of my guild. Both my personal reputation and my guild's reputation are very important to me. I'm MORE likely to pass on offspec or sidegrade gear in a PuG than I am in guild. There are three reasons I would PuG. 1) I'm still looking for one certain drop in content that my guild doesn't do anymore. I'm only there to roll on that one drop, and if it weren't an upgrade/best in slot/something I badly needed, I wouldn't be in there. 2) I'm looking to recruit players for my guild. In that case, I'm in there to find good free agents or players looking to jump guilds. I'm not actually there to roll on anything--though I might pass ostentatiously. 3). I'm there on my alt. By definition, I don't "need" anything, because I have a main with better stuff that I use in progression raiding. I'm there for fun and giggles, and no piece of loot is "important." I'm only going to roll on loot in a really clear case where it's the right thing for my class and spec and no one would question my right to roll. Remember, even though I'm not "myself" I still have my guild tag over my head, and if I have acquaintances in the raid, I'll identify myself by my main's name. My feeling is, Gevlon, if you could find a guild where you liked both the level of progress and the players, that you could avoid having to depend on PuGs for loot. It's when you "need" stuff from PuGs that you get into possible ninja situations. No one, not even a Goblin, wants a reputation as a ninja--what if people stopped buying your auctions because of your bad rep? "Learn to elitest jerks. Theres way better trinkets for mages. Trinkets with spell damage or crit should be your priority over spirit. Trees and Holy priests put spirit above crit or spell damage. The half decent ones wouldn't roll against a mage on a crit trinket." From elitist jerks, the basic theorycrafting thread on priests: "The following stats are of value to healing priests: stamina (minor), intellect (major), spirit (medium), haste (medium-to-major), crit (major), spellpower (major) and Mp5 (medium). For the first time since 2.3, priests should consider items without spirit on them, as our benefits have been nerfed extensively." The elitistjerks resto druid threads are a bit more confusing, there are some druids who say they gem for spirit/int, and some druids who gem for pure sp and berate the druids gemming for mana regen saying that #1 trees don't go OOM in current content and #2 for a 5 minute fight with replenishment and innerv, int > spirit for total mana pool. So to settle that debate, I checked out the gems and trinkets of the Ensidia resto druids. At time of this comment, their gear was pure sp gems, pure sp trinkets, pure sp enchants. In summation, don't tell others to learn to elitist jerks, while either neglecting to visit the site yourself, or being completely understand even the simplest concepts they are discussing. Had to chime in on this one. The group members were correct in that a mage should not be rolling on that trinket. Your quoted abilities are correct, but in today's end-game and in casual play of 5-mans spirit is an essentially wasted stat for mages. From your post I could tell the mage is not your main class, but that's ok. If you want insane mana regen a glyphed Mage Armor is much more than enough for almost every situation. 1. Mages can go OOM in under 90 seconds using a conventional and oft-analyzed dps rotation, despite having replenish up and using mana gems. How often do holy priests and tree druids go OOM in under 90 seconds from full mana? 2. Does Glyphed Mage Armor make each point of spirit more useful, or less useful? 3. You state "Your quoted abilities are correct, but in today's end-game and in casual play of 5-mans spirit is an essentially wasted stat for mages." Did or did not Blizzard (Ghostcrawler) make a statement this week saying that mana regen is essentially a wasted stat for all classes, (in the sense that you get an ample amount by default due to itemization), and that they are looking at ways to make it a valued stat again? Arcane mages get a lot mana-regen from spirit compared with fire, or forst, mages. The question is: is it better to go for a damage trinket, or a spirit trinket? Mana isn't damage. Mana can be turned into damage. Arcane can do so efficiently, and slowly, or inefficiently, and quickly. A regen trinket lets you do the latter more, a damage trinket means you do the former more. It's possible that a regen trinket could be better for arcane than a damage trinket. In order to decide, you would need to work out how much extra damage you could do with the regen trinket (using the mana more inneficiently, but more quickly) as opposed to the damage trinket (using mana more efficiently, but slower). It's also possible for it to go the other way. It depends on the trinket. In this case - in fact, for all the current end-game trinkets, you are better going for a damage trinket (like Illustration, or Sundial, or Embrace, etc.) than a regen trinket. Unless you do not know how to mana gem, or are starved of raid buffs. But then you have bigger problems than choosing a trinket. Well the question is one of social convention. If the PuG is formed with the loot contract of "main spec" rolling, then without explicit case-by-case definition (and who wants to go through that rigomarole for a PuG?) the commonly accepted "main spec" itemization understanding in your particular PuG is what's going to rule the day. If the PuG is convinced that a spirit trinket is NOT a main spec for mages, then you'll have to bow to that consensus or risk mutiny. As you suspected. Of course, being the one organizing the PuG you could easily say, "Main spec rolling, and mages can roll on spirit items" at the outset. Since your concept doesn't jive with commonly accepted usage, putting it up-front can bypass any misunderstandings. It seems the trinket would be of near negligible use to you whereas it might be of considerable use to a resto druid or holy priest, etc. Yes, this was a PuG; yes, you might not see them again, but there is something to be said about reputation and it's value. Hunter passes you the melee weapons, and in return you pass him the guns/bows. Since you can't predict what will drop, this leads to more utility for each person. I'd rather guarantee myself the melee weapon if it drops then get a chance to roll on a gun if it drops, since melee weapons are huge upgrades for a my rogue while guns are little more than minor stat sticks. I'd recommend this agreement to every pug. This isnt a mage spec item, its a healer item. Dont metters if is pug or not, most pugs are /roll main spec.